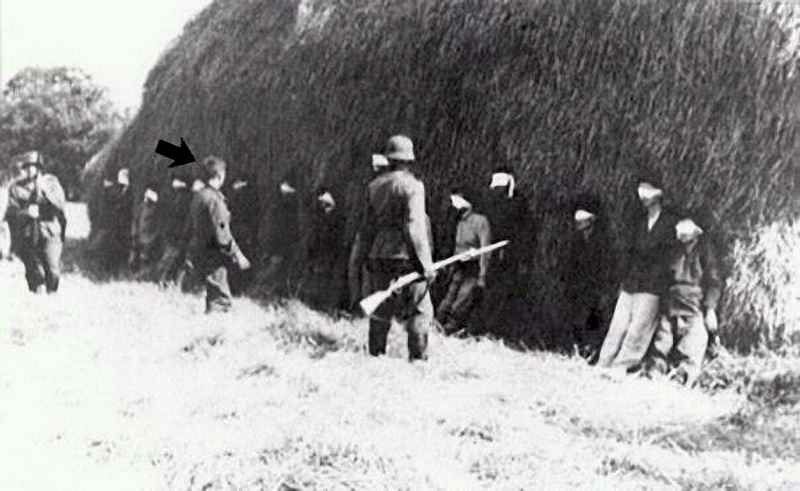 In a very unusual incident, Wehrmacht soldier Josef Schulz (or Schultz, shown with an arrow at left) refuses an order to execute 16 partisans at the Serbian village of Smederevska-Palanca on 20 July 1941 (some sources say 19 July). Schultz drops his rifle and says, "Ich schieße nicht! Diese Männer sind unschuldig! (I will not shoot! These people are innocent!). Schultz' commanding officer shoots him on the spot and buries him with the partisans. Eastern Front: In the Far North sector on 20 July 1941, Finnish VI Corp (General Talvela) continues pressing southward along the eastern shore of Lake Ladoga and east of there. His forces are approaching Salmi, about a quarter of the way down the length of the lake. Soviet 452nd Motorized Infantry Regiment arrives at Salmi and sets up a defensive perimeter. Just beyond Salmi is the 1939 border, and the Germans would like the Finns to cross it - but that is up to Finnish commander Marshal Mannerheim. There is heavy and confused fighting along the Litsa River outside Murmansk. However, the lines do not change, and both sides are slowly beginning to accept a stalemate. At Polarnoye (Polyamy) in Kolafjord, at the entrance to the inlet to Murmansk, Junkers Ju 87 Stukas of the Luftwaffe bomb and sinks Soviet destroyer Stremitel'ny (Stremitenlnyi). The Luftwaffe (Junkers Ju 87 of 12 Staffel, LG 1) bombs and sinks Soviet patrol boat Shtil at Ura Guba behind the Murmansk front. This is believed to be a picture of Josef Schulz (Schultz), the man who wouldn't shoot, 20 July 1941 (some sources say 19 July). In the Army Group Center sector, General Guderian's Panzer Group 2 eliminates Soviet opposition at Yelnya on the far side of the Desna River. The 10th Panzer Division (General Schaal) takes heavy casualties but holds this exposed bridgehead, and it draws close scrutiny within the Kremlin. Guderian cannot expand the position because he is under orders to assist Army Group South in capturing Kiev, but he does put SS Division "Das Reich" into the bridgehead. These orders leave the German Yelnya position in a defensible but vulnerable orientation that is subject to repeated counterattacks. In military parlance, it is a "lightning rod" for the enemy. The Soviets prepare a counterattack at Smolensk with Soviet 24th Army, 28th Army, 29th Army, and 30th Army. The Germans beat off the blows, but it is a sign of things to come. General Zhukov orders four reserve armies forward for the Smolensk operation. The objective is to rescue three trapped Soviet armies - 16th, 19th, and 20th - in the Smolensk suburbs. These armies attempt a breakout at the Nevel-Gorodok road but are stopped by 19th Panzer Division. In the Army Group South sector, Soviet Marshal Budenny (Budonny) commands a large group of forces at Southwestern and Southern Fronts. In total, Budenny has about 1.5 million soldiers at his disposal - one of the largest commands of all time, behind only national leaders such as Hitler or British Prime Minister Winston Churchill. Budenny is one of the most maligned generals of World War II, and his most distinguishing credentials are his stunning handlebar mustache and the fact that he is one of Stalin's favorite comrades at drunken orgies. It is easy to see how Budenny could handle the brewing cauldron of trouble better, which would have ramifications across the entire Eastern Front. Budenny, however, is hamstrung by Stavka orders to defend Kiev and Vinnytsia (Vinnitsa)/Uman without retreating. Stalin essentially has given Budenny unheard-of hordes of men as a sort of test - to see whether that is sufficient to stop the Wehrmacht. With all sorts of opportunities to retreat and form a solid defensive line behind the Dneipr, Budenny instead keeps his troops in an exposed position west of the river. German 17th Army (General Karl-Heinrich von Stülpnagel) continues advancing to the south of Uman while German 11th Field Army (General Karl-Heinrich von Stülpnagel) advances to the north. German Panzer Group 1 also heads toward Uman. It is an obvious trap, but Budenny and the Stavka do nothing to avoid it. 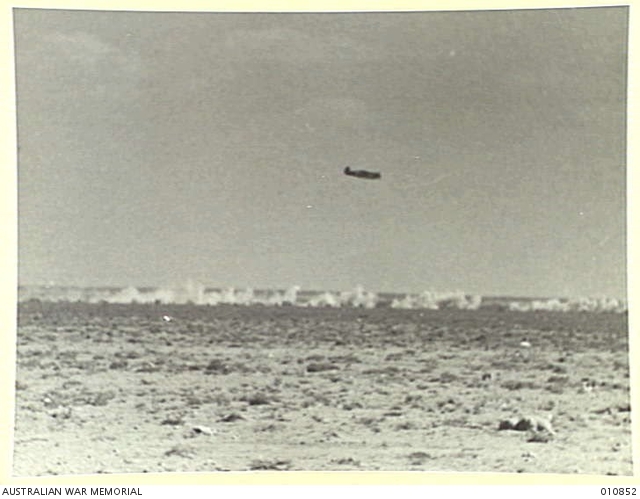 A German Bf 109E from Jagdgeschwader 27 strafing Australian front lines in North Africa, 1941 (Australian War Memorial 010852). European Air Operations: The RAF's continuing "Channel Stop" operation today sees 12 Blenheim bombers of Nos. 18 and 139 Squadrons attack shipping between Berck and Le Touquet. The RAF loses two aircraft, but the planes hit a tanker, whose master is forced to beach it at Berck-sur-Mer. The RAF planes also down a defending Bf-109 fighter. Another raid by three Stirlings on Hazebrouck is aborted due to the weather. After dark, RAF Bomber Command sends 113 bombers (46 Wellingtons, 39 Hampdens, 25 Whitleys, 3 Stirlings) to attack the marshaling yards at Cologne. The bombers complete the run, but poor, cloudy weather leads to inaccurate bombing and little damage. Three people are killed on the ground. There is a secondary attack on Rotterdam by 15 Wellingtons and 9 Whitleys that starts some fires in the dockyard. All planes return from both missions. Lieutenant Walter Nowotny remains adrift in the Baltic after being shot down on the 19th. He prepares for death, writing a goodbye note and observing German shore batteries firing at Soviet destroyers. Werner Mölders is promoted to the rank of Oberst and banned from further combat flying. As a propaganda hero, Mölders is considered too valuable now to risk in the air war. He is transferred to the Reich Air Ministry in Berlin, where he effectively is placed in reserve pending reassignment. Battle of the Baltic: The Finns reinforce their small force on the Finnish island of Bengtskär, which houses a 52-meter lighthouse that is a good observation post at the entry of the Gulf of Finland. The 2nd Rannikkoiskukompania (Coastal Shock Company), led by Lt. Fred Luther, can use the island to spot Soviet ships operating near the Soviet-held port of Hanko, Finland. "Members of the South African Division of the Royal Naval Volunteers Reserve on board HMS NELSON posing for the camera between two of the enormous 16-inch guns of A turret," July 1941 (© IWM (A 4608)). Battle of the Atlantic: U-126 (Kptlt. Ernst Bauer), on its first patrol out of Kiel, is operating about 1200 km (750 miles) west of Land's end when it spots 8293-ton British freighter Canadian Star. Bauer attacks with torpedoes but misses. He then orders the U-boat to the surfaces and uses the deck guns, scoring a few hits during a 10-minute attack. The Canadian Star, however, also has deck guns and returns fire, which drives U-126 off. Bauer manages to damage the freighter, but it gets away (ultimately to Curacao) and he barely avoids getting sunk himself. So, U-126 must wait further for its first sinking. Some sources say that U-126 fired torpedoes that missed, but that it was U-203 (Kptlt. 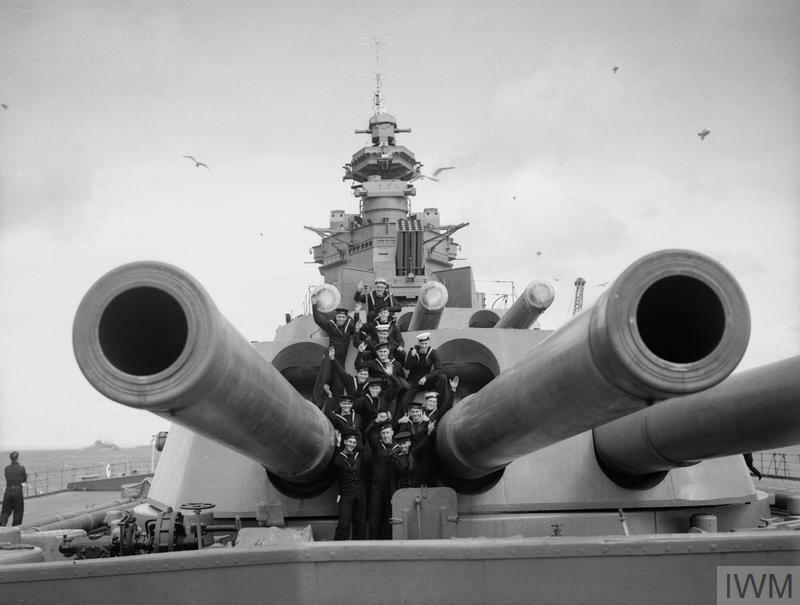 Rolf Mützelburg) lurking nearby that surfaced and used its deck guns against Canadian Star. U-95 (Kptlt. Gerd Schreiber), on its fifth patrol out of Lorient, is operating southwest of Bantry Bay, Ireland when it spots 5419-ton British freighter Palma. Schreiber fires torpedoes and misses. He then decides to use his deck gun. The U-boat scores some hits, but the freighter gets away. The Luftwaffe bombs and damages 4419-ton British freighter Umvuma (named after a small mining town in Zimbabwe) off the Humber. The damage shuts down the engines, but the crew improvises and still manages to get the damaged freighter to Humber. Norwegian 3916-ton freighter Brynje hits a mine and sinks in Skagerrak off Kalundborg, Denmark. The entire crew survives. The ship is later salvaged for scrap in July 1944. Convoy OG-69 departs from Liverpool bound for Gibraltar, Convoy WS 9C (Winston Special) arrives at Gibraltar. It includes ships destined to sail directly from Gibraltar to Malta as part of Operation Substance. Royal Navy destroyer HMS Lively is commissioned. HMS Lively, shown here on 20 November 1941 in Grand Harbour, Valletta, Malta, is commissioned on 20 July 1941 (© IWM (GM 165)). Battle of the Mediterranean: Royal Navy submarine HMS Union (Lt R.M. Galloway), on its fourth patrol out of Malta, spots a small Axis convoy departing from Tripoli. It represents a tempting target, as two tugs (German Max Berendt and Italian Ciclope) are towing disabled German freighter Menes. Union attacks 25 miles southwest of the fortified Italian island of Pantelleria, bu misses. Italian torpedo boat Circe responds by dropping depth charges that sink the Union. There are 31 deaths, everybody on board the submarine. The dangerous nightly Tobruk Express run is made by Australian destroyer HMAS Stuart and minelaying cruiser HMS Latona. The ships operate on an extremely tight schedule which is intended to get them well away from the port by daylight to avoid Luftwaffe attack. However, the ships arrive late and things go disastrously wrong during the unloading process, so the Australians in the port can only unload about 50 tons of Latona's much-larger cargo before it must button up and depart. Both ships arrive back at Alexandria safely. Royal Navy submarine HMS Utmost is operating near the island of Ustica north of Palermo, Sicily and attacks a freighter, but misses. Royal Navy submarine HSM Tetrarch is operating in the Aegean when it unsuccessfully attacks an unidentified freighter. 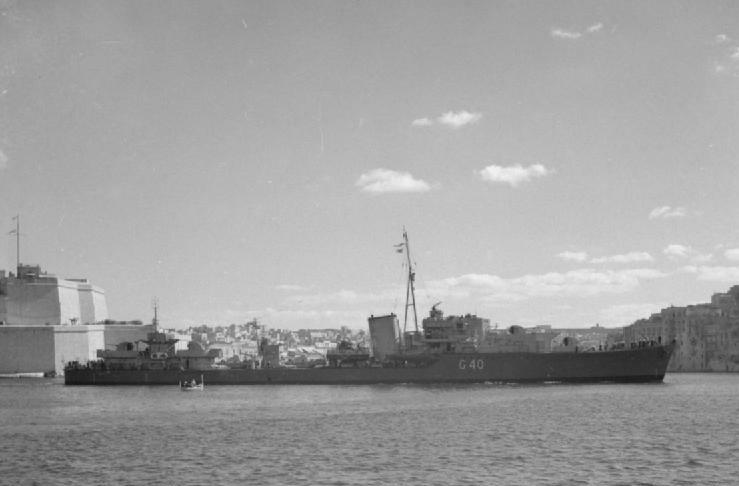 In Operation Guillotine, New Zealand light cruiser Leander, destroyer Kingston, and destroyer Jervis (Jervis goes directly to Cyprus) depart Haifa on the 20th for Port Said. There, they embark troops for transport to Famagusta, Cyprus. The ships all make it safely to Cyprus during the night. As part of Operation Substance, a supply mission to Malta, Royal Navy submarines HMS Upright and Unique depart from Malta. They take up stations off the Italian coast in order to waylay any Italian ships departing to attack the Operation Substance convoy. Nine RAF Wellington bombers based at Malta attack railway yards at Naples, causing extensive damage. Partisans: In the continuing uprising of 13 July in Montenegro, insurgents capture Bijelo Polje. Reflecting the growing power of the rebels, the 180 soldiers and officers in the town are taken prisoner or killed. Italian troops not only are not counterattacking, they are retreating to fortified strongholds at Pljevlja, Nikšić, Cetinje, and Podgorica. "The Home Guard: During an exercise involving the local Home Guard, ARP personnel and the Police in Northen Command, 'enemy' forces succeeded in taking a town after a bitter struggle but were later overpowered. 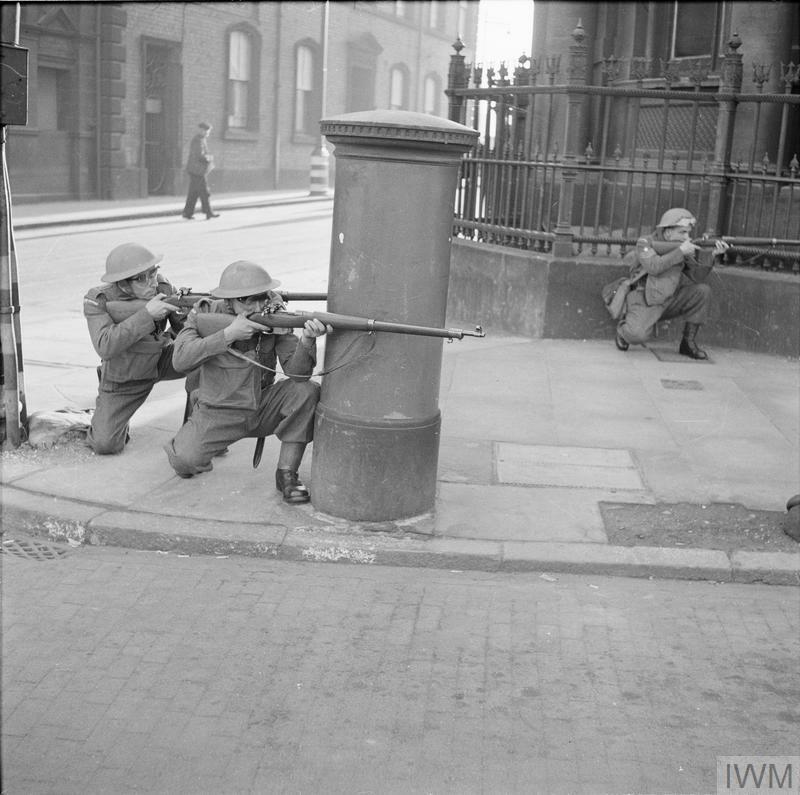 Photograph shows the Home Guard firing at the 'enemy' in the street behind the cover of a post-box. 20 July 1941." © IWM (H 11852). Propaganda: Many people across Europe take up the "Colonel Britton" BBC radio demand broadcast at midnight on the 19th for people to scribble "V for Victory" as a sign of resentment against German rule. There are reports of incidents in Holland, Belgium, France, and even some areas of the Reich itself (the provinces of Bohemia and Morava, formerly Czechoslovakia). To attempt a landing in force would be to encounter a bloody repulse, and petty raids would only lead to fiascos doing far more harm than good to both of us. You must remember that we have been fighting alone for more than a year, and that, though our resources are growing, and will grow fast from now on, we are at the utmost strain both at home and in the Middle East by land and air, and also that the Battle of the Atlantic, on which our life depends, and the movement of all our convoys in the teeth of the U-boat and Fokke-Wulf blockade, strains our naval resources, great though they may be, to the utmost limit. Churchill only promises to continue RAF and Royal Navy attacks for the time being. 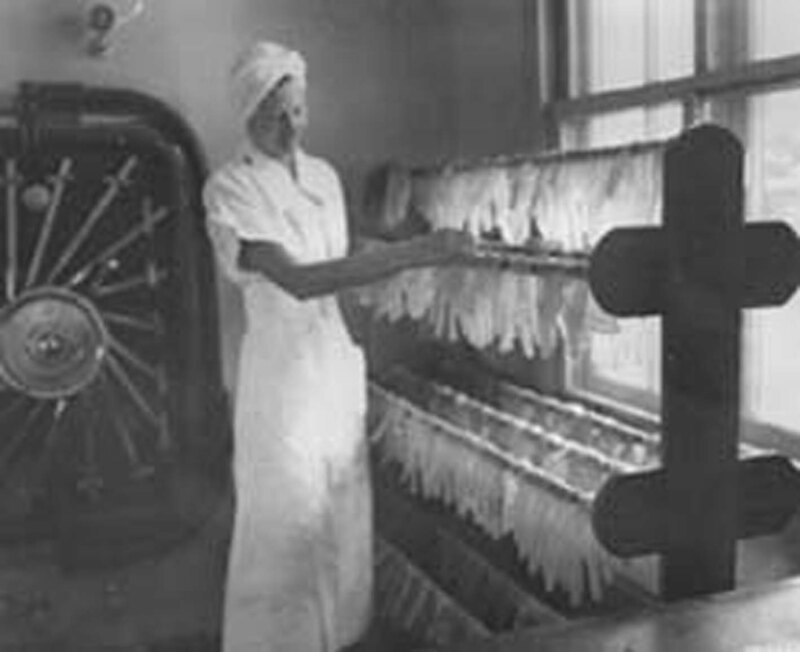 Nurse Bernice Simmet selects a pair of rubber gloves for use during an appendectomy. Fort Benning, Georgia, 20 July 1941. Soviet Military: Stalin takes over as People's Commissar of Defense from Marshal Semyon Timoshenko, who is demoted to command of the Western Front. Stalin is careful throughout the war to buttress his unchallenged control of the Soviet government with top military posts and ranks normally not taken by civilian leaders. Stalin makes Lavrentiy Beria the new commander of the NKVD, which is formed out of the Commissariats of Home Affairs and National Security. This forces Vsevolod Merkulov to step down as the People's Commissar of State Security (NKGB, which now becomes the GUGB) of the Soviet Union and become Deputy People's Commissar of the NKVD. Stalin marks his "appointment" by issuing an order to "purge all unreliable elements" in the military. In practice, this means having state security (now the NKVD) detain and interrogate any soldiers who escape German encirclement. These interrogations are not gentle, and the soldiers remain under suspicion of being spies henceforth. 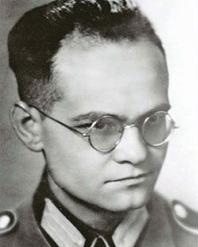 German Military: A Wehrmacht soldier of the 714th infantry division, identified as Josef Schulz (or Schultz), refuses to participate in executing 16 "partisans" in Serbia. The executions take place anyway within the barracks of Smederevska Palanka, southeast of Belgrade. Schultz' commanding officer immediately shoots Schulz dead and buries him with the partisans. The incident is completely forgotten until the early 1960s when two German weeklies publish some photographs of the incident that lead a West German Bundestag member, Wilderich Freiherr Ostman von der Leye, to identify the person on the photographs as Josef Schulz. There is serious disagreement as to whether the person in question was Schultz, but that the incident happened with some Wehrmacht soldier is accepted. British Government: Brendan Bracken becomes the new Minister of Information (MOI). Bracken is a close crony of Winston Churchill, having previously been his Parliamentary Private Secretary, and his appointment is a clear indication that Churchill intends to exercise an ever-tighter rein over BBC propaganda efforts. The idea of a "free press" is fast becoming but a memory in Great Britain due to rigid censorship and carefully managed official announcements intended to service the war effort and not any airy "right to know" by the public. Heinrich Himmler at Lipowa Camp, a Lublin sports field converted into a transit camp for Jewish forced laborers selected from Polish Army POWs, 20 July 1941. 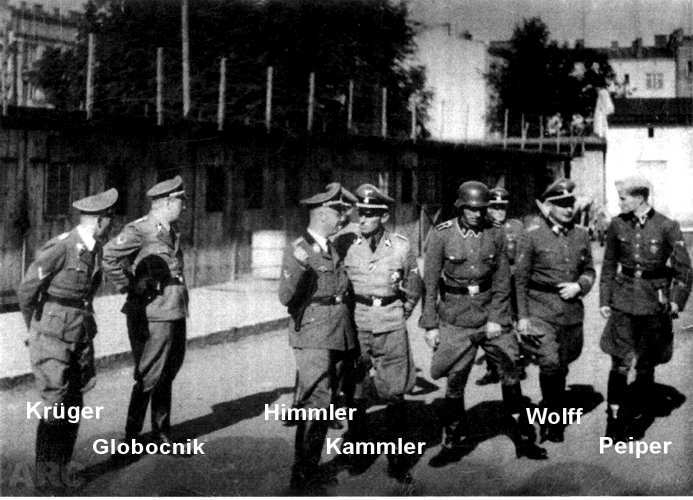 Note the presence of Himmler's top aides, Wolff and Peiper, and Hans Kammler. 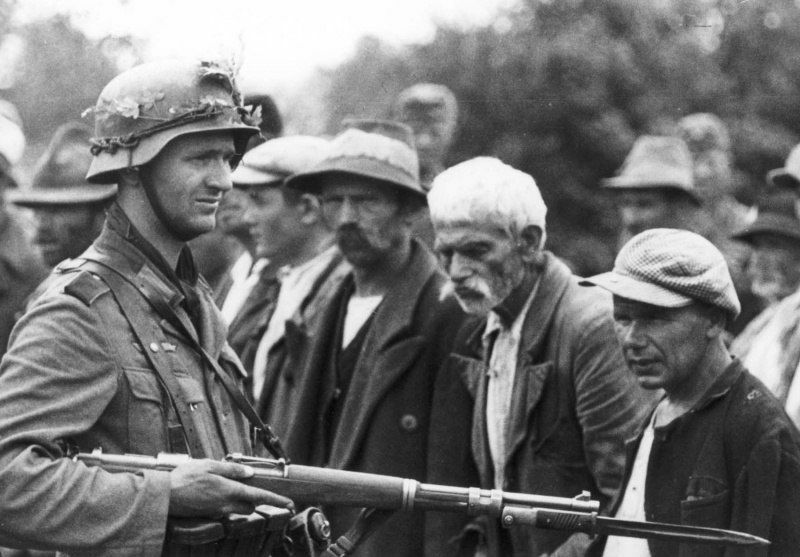 Holocaust: Reichsfuhrer-SS Heinrich Himmler orders Odilo Globocnik, the local SS- und Polizeiführer at Lublin, to prepare to cleanse the district of Jews and Poles. The goal is to make it purely Germanic. Lack of confidence in the word of its chief executive is a real disintegrating force in any nation and any army. Landon does, however, offer support for continuing the draft, which is due to expire soon without congressional action. He does so grudgingly, however, concluding that "The President has the country out on the limb now, and we have got to strengthen the tree at the base." 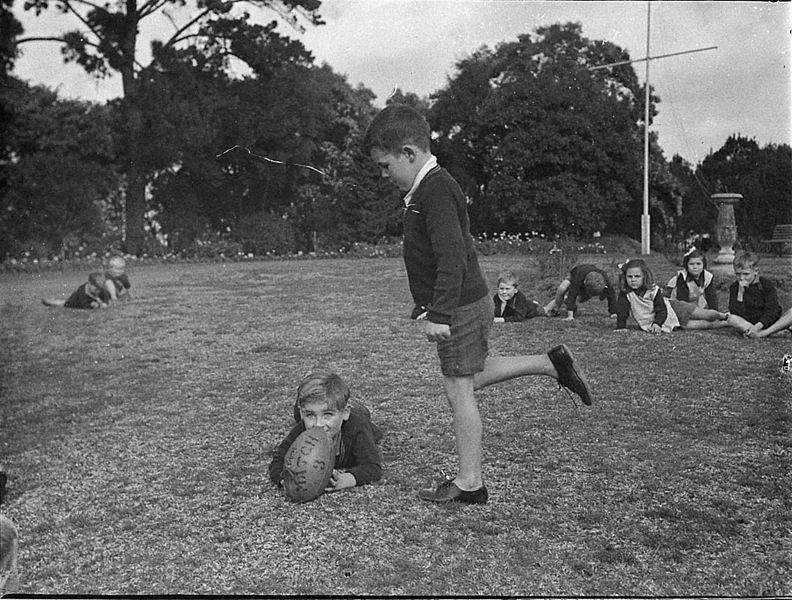 Children at play, Dalwood Homes, Balgowlah, New South Wales, 20 July 1941 (Sam Hood, State Library of New South Wales).